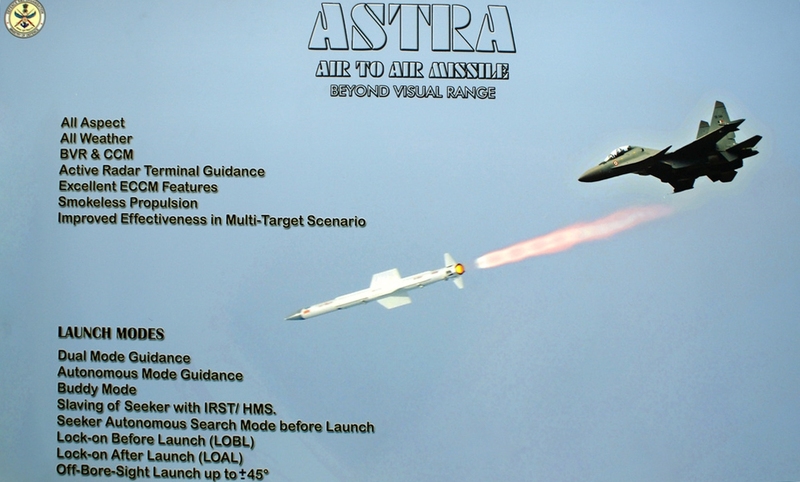 India’s indigenously developed Beyond Visual Range (BVR) air-to-air missile Astra was successfully test fired from Sukhoi-30 fighter aircraft. The test was undertaken at the Integrated Test Range located at Chandipur in Odisha. During the test, missile successfully hit a simulated target and also proved its manoeuvring capability against a simulated target and also validated its various subsystems. Astra is single stage solid fuelled and has payload capacity of 15 kg conventional explosives. It is an all-weather, state-of-the-art missile developed by DRDO and can engage and destroy enemy aircraft at supersonic speed (1.2 Mach to 1.4 Mach) in head-on (up to 80 km) and tail-chase (up to 20 km) modes.The missile can reach up to 110 km when fired from an altitude of 15 km and 44 km when launched from an altitude of 8 km and 21 km when fired from sea level.The missile can be integrated with fighter aircraft including Sukhoi-30 MKI, Mirage-2000, MiG-29, Jaguar and the Tejas Light Combat Aircraft (LCA).